Wearing a cast does not have to keep you from living your life. In order to keep my mind happy, I need to do things, including going places and just moving around in general. I cannot sit still. I never have and probably won’t until I’m gone. Even then, I might leave a hum in the air. But I am at the point where I have got to try fixing my feet and ankles, and I don’t want to stop living to do it. Going to the store on a knee scooter is *almost* fun for me, rolling around the store. It has a little basket on the front which has proven to be very useful. 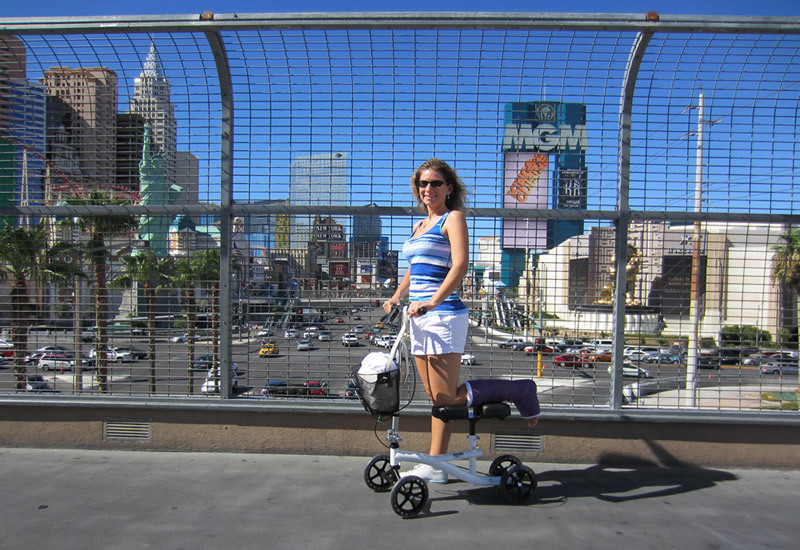 I used the knee scooter in Vegas and scooted 5 miles in one day! One thing I learned – people stare. Scott and I joked that celebrities could hire me if they were looking to go incognito, because even though people were staring, they were only staring at me. Wearing a cast brings attention, but they’re also colorful and stand out, so that’s expected. They looked at my foot in the cast, at my leg on the scooter, at the scooter itself, at me as a whole. Some people talked to me or asked questions, but a lot didn’t. Part of me is all, “Look at me go!” But there’s another part that wants to hide away and just blend in with the crowd. It can be very awkward to try to go about your business and ignore the gawkers. I don’t mind the glances or the staring. I don’t think anyone is being offensive in any way. People like to study interesting things that are different. I’m not offended. I’m definitely different…I like to think I’m totally interesting and a people-watcher myself, so I get it. I scoot around, usually with a smile on my face and a generally pleasant attitude, and I think that baffles some people. But who cares what they think about how I look? I didn’t know anyone there and I didn’t care. Ok, part of me did, but I just told her she was nuts and to go back into hiding. I wore cute outfits and felt good, it was our 5 year anniversary, I was so happy to be there with my hubby and was having a great time! 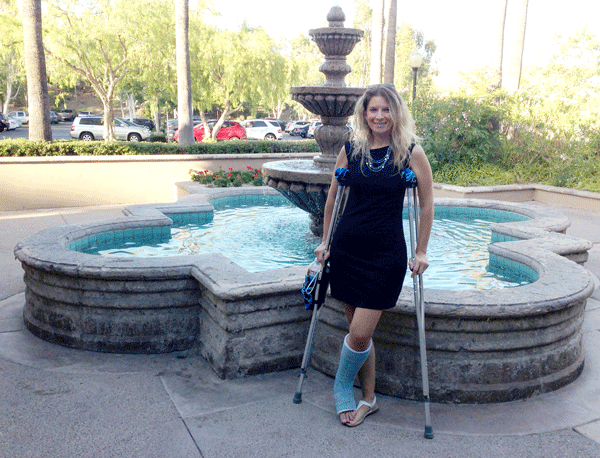 I wasn’t going to let wearing a cast, gawkers or losing my job bother me (yeah, that happened, too). On the phone where they’re telling me the company was sold and I got cut. At any rate, there’s definitely something about casts that makes people curious. The only thing I’m missing now is an awesome story to go along with it. Telling people I get fractures from Celiac disease is received with confusion and requires more of an explanation, which is good sometimes because then I can bring more awareness to Celiac. Sometimes I come up with something creative, like tell them I broke it while hang-gliding. It depends on my mood. Sometimes, the story is my silver lining. It was the very beginning of July 2013 when I was at my endocrinologists office and she was going over my bloodwork. I made the initial appointment because I had been getting sicker and sicker and had no idea what was going on. I thought it had something to do with my Grave’s Disease, an overactive thyroid disorder, and the fact that I had radioactive iodine treatment to stop my thyroid from working. My doctor ran some blood tests and here we were to go over the results. She let me know I had Celiac disease, and a very severe case of it, according to the numbers. I hadn’t heard of celiac disease before and had no idea what it meant. She said all I had to do was go on a gluten-free diet, eliminating wheat, barley, rye and oats and I should be fine. It was that easy? I thought. I even asked her, are you sure that’s all I have to do? And she assured me if I didn’t eat gluten, I would feel better. I left her office thinking I got away lucky. All I had to do was change my diet? Done! I had already thought it was something I was eating that was causing me to get sick all the time and had been eliminating some foods from my diet, though it seemed to be after I ate anything I got sick. Imagine, there I was, eating saltine crackers for breakfast thinking that that’s what doctors say to eat if your stomach was off. And here they were, those poisonous crackers, causing me to have the stomach problems in the first place. If it meant I couldn’t have a cheesesteak anymore, so be it. I just wanted to feel better. I was on a mission. No gluten. I researched a gluten-free diet and went to the store in search of gluten-free items. The local grocery store didn’t have much at all, but I could get some things there, like spaghetti sauce, meats, fruits and veggies. The local health food store had more to choose from, but still not much. Gluten was in EVERYTHING it seemed, and it was really cheap. Gluten-free stuff is expensive! The first few months after the diagnosis weren’t easy as I got used to a gluten-free lifestyle. I was easily frustrated when I wouldn’t be able to find good tasting food, because not much of it did taste good. It was even harder to make said food. I could do this, I thought. It was going to be more cooking on my part, we were serial take-out-ers before, but that’s ok. It was time to grow up. I did ok for a few months, then I went out for Thanksgiving dinner and though I was careful to only eat gluten-free foods, I got sick after eating the turkey that had the stuffing cooked inside. I didn’t even think of that possibility. The sick lasted about 3 months. I felt horrible in the stomach, bloated and gassy, it felt like something was ripping through my intestines, and it took forever to make it’s way through. My mood changed, I was easily frustrated and snapped at people. I hurt all over. My joints ached, my back and neck hurt, my stomach hurt, it was like all of me hurt. It took a while, but I finally got over that glutening and started feeling a little better, but still not great. 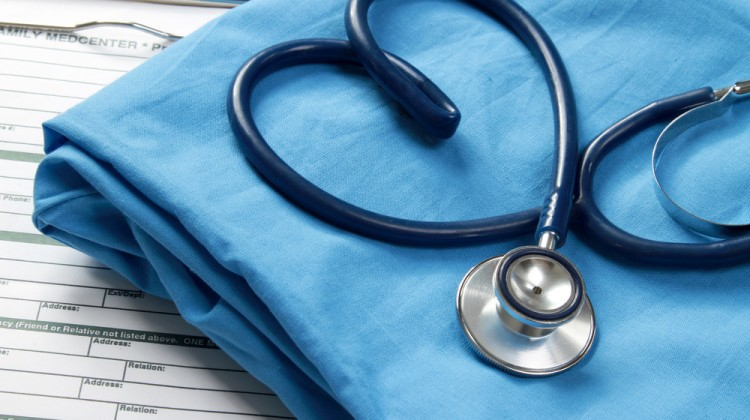 I continued to research the disease and all that it entailed. There was some info about celiac disease, but not that much. Most of it dealt with the diet. Change your diet and you’ll feel better. Well, what happens when I don’t feel better after changing my diet? I had to find out, so the research continued. I’m now 2 weeks postpartum and things are healing up and shrinking back down to size. I didn’t have to take the pain meds my doctor prescribed, though that could be due to a high pain-tolerance. I also wonder if the fact I have a high pain tolerance can be attributed to the Celiac disease. Were my nerve endings fried from over-use? It’s a valid question. I’m allowed to start driving again but not much exercise yet. I’ve done a little bit of stretching here and there and am thinking about incorporating some light yoga because I feel tight in the core. I think that’s attributed to my ligaments and tendons tightening up again. I still feel pain in the uterine area and have been having some major headaches over the past few days. I’m not sure if that’s due to my hormones changing or stress, but probably both. It could also be because I noticed I’m clenching my jaw quite often. It seems the things that were bothering me before I got pregnant are starting to come back, like the TMJ syndrome and my leg is starting to bother me again. When I was pregnant, it seemed like my neck and shoulders relaxed more, due to an influx of relaxin in the system, but now I guess it’s wearing off. I’m still gluten-free and added extra vitamins and fruit/veggie juice, though I’m not much in the mood to cook. Standing for a while isn’t easy yet and I still tire out pretty quickly. I’m also sad for what I lost. All our hopes and dreams and things we wanted to do with our little guy. We were planning and preparing so much for his arrival and now nothing. It’s hard to be happy today, feeling like there’s not much to look forward to at the moment. Though Scott did get an embroidery machine and I’m SO excited to start making things! That made me smile with my eyes. Other things are starting to look up, also. Max really gave me quite the gift. I just wish he was here, to hold and cuddle. Well, I wish he was still in my belly, growing healthy and strong. I find myself staring into space, lost in my thoughts, not able to stop thinking about Max. I’m still in shock over what happened. How does my body just not hold my baby in anymore? It’s not that uncommon – it happens to 1 million babies every year with millions of other babies born prematurely. How does it happen to so many babies and there’s not more research or attention on cervical incompetence? Why does it happen? Is it genetic? Is it because of Celiac? Would having an autoimmune disease, which causes the body to attack itself, cause the cervical area to weaken as well? Is there a safe way of checking the cervix at appointments if you have risk factors that weaken the body and immune system? There actually is, I found a medical device called CerviLenz that measures the cervix. I gave a printout to my OB to research for her practice. I hope they incorporate it in their office, in fact, I hope many OB offices use this device to measure the cervix at routine checkups. I know there’s no way to guarantee it will be caught, but if it saves some lives, even one, it’s worth it. I’m heartbroken over the loss of so many perfectly good lives and one of my worries is that it will happen again. I know there are things they can do but it happened so fast, will they catch it in time? What can I do to strengthen that area so I have a better chance of holding the baby in? These are all questions I’ll be looking to answer over the coming months. I’m going to work out and get my body in super ship-shape, building a strong core and legs. Hopefully that helps to strengthen my insides too. Plus, there’s always kegels. I was doing them with Max, gotta keep it up. Now to just get through this time of “taking it easy.” Easier said than done, but I gotta try.